Whether it’s good or bad, the fact is that our credit scores have become the king of our financial lives. If you apply for a credit card, a mortgage, , an automobile loan, an apartment or even auto insurance, guess what’s the first thing that will be checked. Yes, it will be your credit score. Nobody outside of FICO knows exactly how credit scores are calculated. This is a carefully guarded and proprietary algorithm. However, it is known that credit scores are composed of five components – credit history or on-time payments, capacity used, length of credit history, types of credit used and credit applications. Of these five components, the first two are the most critical because it is believed that they account for 65% of your credit score. Credit scores are grouped into ranges. They are as follows. 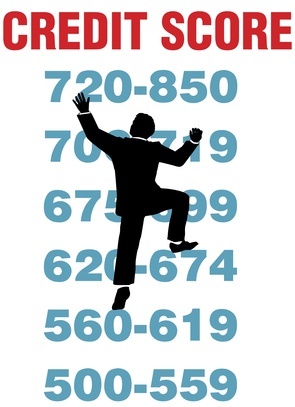 Between 700 and 850 – Very good or excellent credit score. Between 680 and 699 – Good credit score. Between 620 and 679 – Average or OK score. Between 580 and 619 – Low credit score. Between 500 and 579 – Poor credit score. Between 300 and 499 – Bad credit score. People who have scores above 700 are considered to be “golden” and can get just about any sort of credit that they would apply for. Conversely, if you have a score of 580 or less, you’ll have a tough time getting credit and if you do get new credit, it will come with a high interest rate. There is a simple reason why credit scores have become king. Credit reports are usually very long and complicated. Few lenders are willing to invest the time required to wade through the 12 or more pages of a report when they can just check your credit score instead. Here, courtesy of Bankrate.com, is an example of how your credit score would affect the interest you would pay on a mortgage. As you can see from this table, it is much better to have a credit score of 760 or above vs. one of less than 580 as this could mean a difference of more than 3.5 points. And this would translate into thousands of dollars more you would pay over the life of a 30-year mortgage. Of course, the example of what you would pay if you had a credit score of less than 580 is relatively hypothetical as the odds are you wouldn’t even be able to get a mortgage. Unfortunately, there’s not much you can do short term about a low credit score. If you have a score of 620 or lower, it’s probably because you’ve made some serious mistakes in in the way you’ve handled your credit. You’ve probably missed payments or even defaulted on a loan or a credit card. Worse yet, those bad items will stay on your credit report and continue to affect your credit score for seven years. This means you’ll just have to slog it out, take care of any unpaid balances or defaults and be sure to make your payments on time every time until those bad items fall off your credit report.